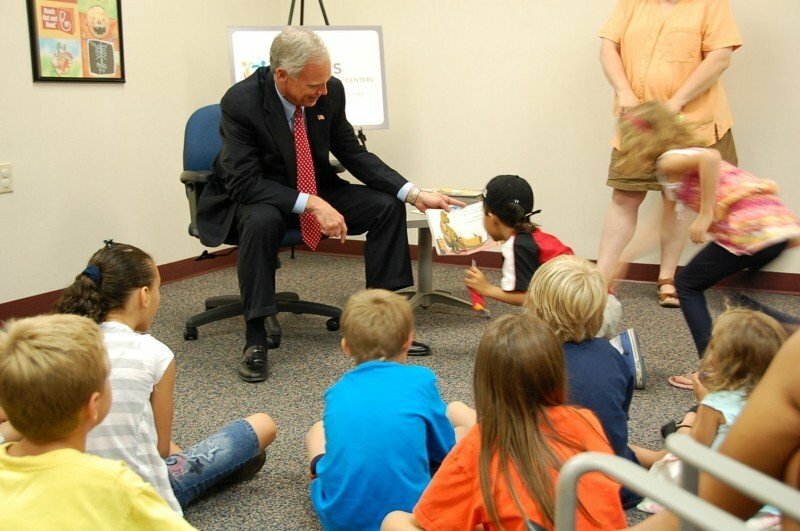 U.S. Sen. Ron Johnson of Wisconsin reads "How Do Dinosaurs Clean Their Rooms?" to children Thursday at the South Park Street location of Access Community Health Centers. Time for an online Circle Time. Let's talk about our feelings in the wake of my story about children's author Jane Yolen's reaction to hearing Ron Johnson had read her book "How do Dinosaurs Clean Their Rooms?" to kids at a local community health clinic. But first, in the interest of full disclosure, I'll answer a few questions I was asked after writing these stories: 1. Yes, I do live in liberal Madison. 2. Yes, the Cap Times is a liberal newspaper. 3. Yes, you can call me a "hack" if it makes you feel better. 4. Yes, I am a personal fan of Jane Yolen's books. 5. No, my children and I knew nothing about her political beliefs until recently. Her books thankfully have nothing to do with the nasty world of grownups and politics. 6. Yes, I do have a bias: I believe children deserve to have good health care and good books in their lives. Okay, back to Yolen, the award-winning author who has created quite a storm by telling me that she thought it was "more than a tad bit disingenuous" for a politician whose policies she feels will harm children and libraries to use her book and young fans for a photo opportunity. Some of you cheered. 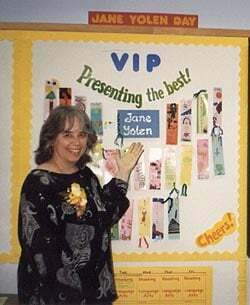 "Go Jane Yolen Go!" reads the headline of a Democratic Underground post about what has become a tempest in the blog pot. Some of you booed. Among the milder and more printable remarks from these critics is the charge on Green Bay WTAQ New Talk's blog that Yolen is being "completely childish." After reading through the 110-and-counting comments at the end of my last story on this and dozens of other remarks on conservative blogs across the country, though, it seems to me that conservative critics are the ones who are having a tantrum here. News about Yolen's comments spread like wildfire through their blogosphere. It was sort of like that game in grade school called "Telephone." You say one thing and by the time it gets passed around something totally different comes out. Take one of the first guys to play, Moe Lane. In a post on the far right blog RSRedState he calls Yolen "a hateful bigot" for, in his words, telling conservatives she doesn't want "your filthy conservative eyes" reading her books. No, Moe. That's not exactly what she said. The only reader she talked about was Johnson, and what she said in my interview was that it got her "alternately amused, bemused, and annoyed" to learn that a tea party senator---someone whose views differ from her own, since as she puts it she is a Massachusetts liberal who worked for George McGovern----is reading one of her books to children. Didn't our teachers talk on the rug about how we are all entitled to our feelings? Yolen didn't say that Johnson has cooties. She didn't say he was too fat or too skinny. She didn't even say that he was what many of you started calling each other on one of these threads, "stupid." Some of you can't believe that here a real live senator shows up in Madison to do something nice---read a book to kids about dinosaurs learning to put their stinky socks in the wash---and the author doesn't even say thank you. Well, she doesn't say thank you because she thinks that after the cameras go away the politics and policies that Johnson supports will stick around to hurt children. That's her opinion boiled down as simply as I can put it. Yeah, I know, lots of you have opinions, too. And some of you are now saying you never want to buy one of her books. Ever. Again. Maybe we all just need some hot chocolate and animal cookies. Or a nap. "how Do Dinosaurs Clean Their Rooms"